Before heading to the Church on the Spilled Blood, we stopped for a quick lunch at a little takeout cafe that sold what our guide called "blinies." I think it was another name for blintzes or it was the way she translated the Russian word to English. They were basically like a crepe only heavier and wrapped around whatever filling you wanted to choose from their list. Some fillings were sweet and others were like ham and cheese. 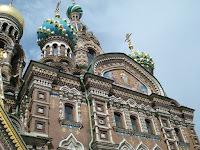 The Church on the Spilled Blood was impressive from the outside the first time we saw it but this time we actually got to look inside and stand in absolute awe of the workmanship there as well. 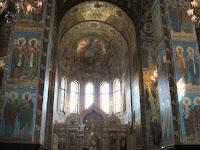 The church is built on the spot where Alexander II was assassinated in 1881. 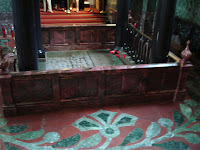 There is a section of actual cobblestones from where his blood was spilled from the assassin's bomb thrown at his carriage. The church was built between 1883 and 1907 but closed for services in 1930. Since then it has been scheduled many times for demolition but always managed to survive--as a morgue during the war, as an opera house later. Eventually it was declared to have historic value and slated to be restored as a museum. The first stage of restoration was completed in 1997 and it was opened to the public. 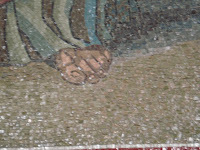 Mosaics adorn the outside and inside of the church building--astounding detailed mosaics. 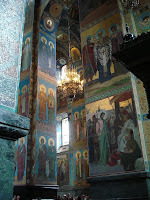 Inside there are religious scenes and depictions of Bible characters and saints. Some they found too heavy to mount on the walls and so replicas are painted high on the walls of the domes where they were to hang and the actual mosaics are displayed at ground level. Take a look at the detail of one of the mosaics on the pillar and imagine the workmanship, th e care and the patience to assemble this kind of artwork on such a huge scale. When I stepped back and thought of the enormity of the project I was in awe of the dedication of those involved in its original building and its restoration. Pardon my God Moment but as awesome as this was, I thought of how God takes even more care in putting together life's most intricate and delicate mosaic.